The Nissan Qashqai is now Ireland’s best-seller in 2018. The Irish new car market posts a 15th consecutive year-on-year decline in March at -10.7% to 17.767 registrations, leading to a year-to-date tally down 5.5% to 71.805 units. Thanks to deliveries up 13% to 11.9% share, Volkswagen remains in the brands pole position and reclaims the YTD lead at 10.5%. Nissan (-23%) is up one spot on February to #2 despite a steep drop, with Hyundai (+19%), Ford (-20%) and Toyota (+5%) in tow. Kia and Skoda both gain 5% but the remainder of the Top 10 falls painfully: BMW is down 49% and Renault down 21%. Further down, Subaru (+155%), Jeep (+78%) Honda (+57%), Seat (+29%), Peugeot (+16%) and Mitsubishi (+12%) defy the odds with double-digit gains. 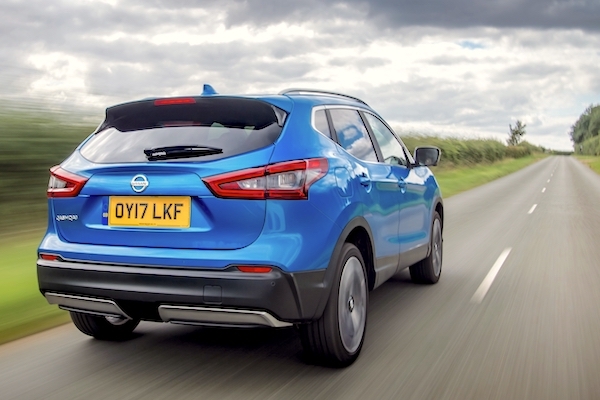 Model-wise, the Nissan Qashqai (+1%) frankly dominates the March charts with 5.1% share vs. 3.5% for the #2, the VW Golf (+19%) and as a result snaps the #1 YTD spot off the 2016 and 2017 leader the Hyundai Tucson, down 22% to #4 this month. The Kia Sportage (+25%) climbs 5 spots on February to #3, making it 3 SUVs in the March Top 4. The Nissan Micra (+53%), VW Polo (+42%), VW Tiguan (+28%) and Toyota Yaris (+18%) also impress in the Top 10. The Hyundai Kona tops recent launches again at #16 (-2) ahead of the Skoda Karoq at #28 (+11), VW T-Roc at #34 (+4) and Kia Stonic at #44 (-1). Full March 2018 Top 33 All-brands and Top 235 All-models below.